Preheat the oven to 350°F and place a rack in the center. Butter two 8-inch cake pans and line the bottoms with parchment paper. Beat the Baker’s Sugar and butter together in the bowl of an electric mixer until light and creamy (3-4 minutes). Beat in the eggs, one at a time; mix in the flour and baking powder. Pour into the prepared pans, smoothing the tops. Bake until golden and springy (25-30 minutes; a toothpick inserted into the center of the cake should come out clean). Let cool; then turn out onto a rack and cool completely, flat sides down. In a medium-size bowl, combine the berries, 1 tablespoon confectioner’s sugar and lemon zest; set aside. 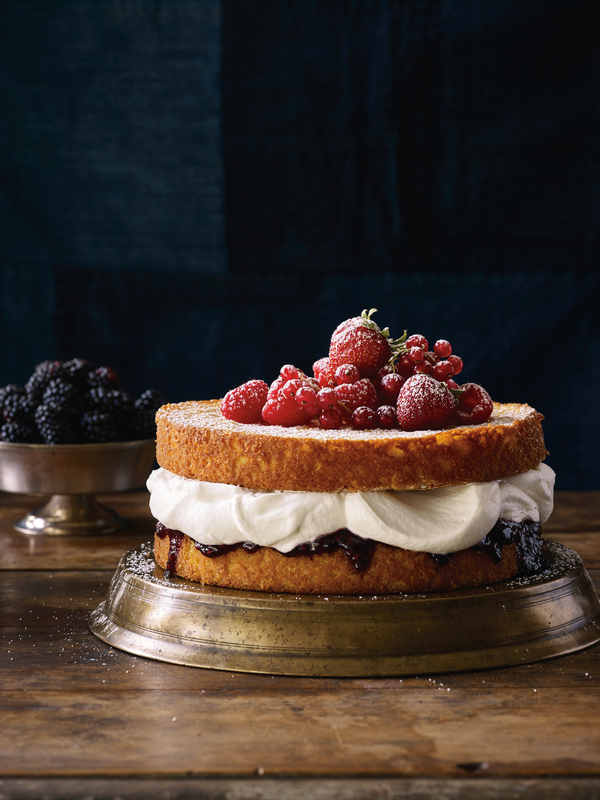 Place one cake on a serving platter and spread the jam over the top. Beat the cream in the bowl of an electric mixer with the remaining tablespoon of confectioner’s sugar until it holds soft peaks. Dollop half of the cream over the jam and cover with the berry mixture. Place the remaining cake on top and dust with confectioner’s sugar. Serve with the remaining whipped cream. *Or use granulated sugar finely ground in a blender or food processor.